2019 Dress Appointment sign ups are now open! First: Click here to complete your 2019 Teen Participant Waiver. Second: Click here to complete your 2019 Guest of Participant Waiver. 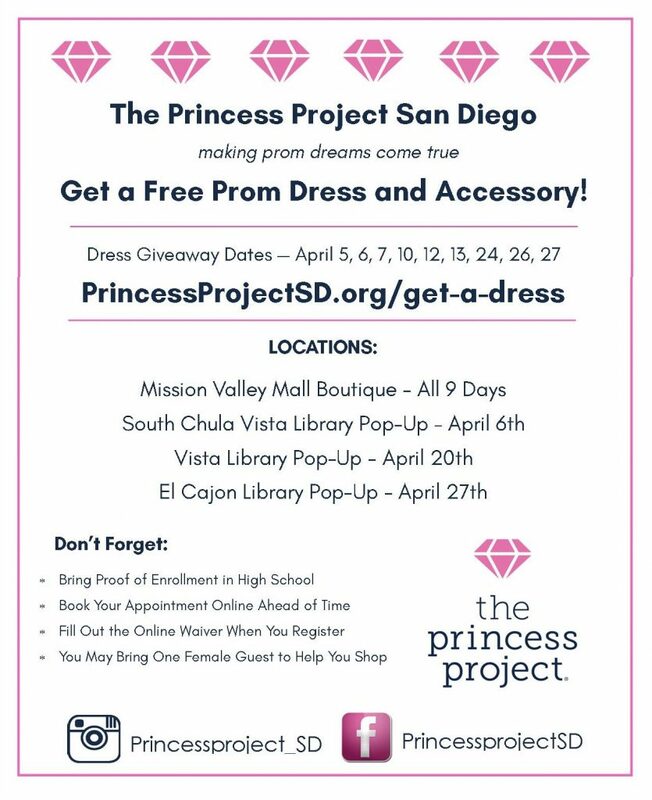 Third: Click here to book your 2019 appointment for a free prom dress and accessory. ***Please note: We have moved – we are no longer at Horton Plaza and are now at Westfield Mission Valley Mall! We are located next to DXL Men’s Store, and are directly across from LensCrafters. Our closest Anchor Store is Macys Home Goods. Parking at Westfield Mission Valley is free. For a map of Westfield Mission Valley, click here. If you have questions or need assistance, please contact us at getadresssd@princessproject.org.